Sadly, despite that it does say "Flies alongside Flying Mount", my poor lil Seth (what I named mine) stays on the ground when I take off (and thus desummons). I don't know if this was just luck but when I farmed for this crow in daylight it did not drop after over an hour farming on multiple realms/toons. I decided to have a look around and found Rona Greenteeth at 36.53, 57.96 and she had for sale a potion called Inky Black Potion for 3g 33s 33c. I decided to purchase it and use it. The day turned to night and I got 2 ravens in 4 battles. Give this a try if you are not having luck or try at night. Good Luck!! I am on an average pop server (ravencrest, bound with uldaman), and I did 3 fights with the glowflies, the first had a P/S crow, the second one did not house a crow, but the third had an S/S crow (common, but stone-able). I think this pet isn't too hard to find. 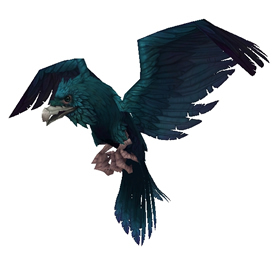 whats the best breed of crow to have in pvp and npc pvp? Create about 4 chars on different low pop servers. Use terrible Turnip for capturing the crow (it has slot 1 ability that cannot kill the pet you want to capture). 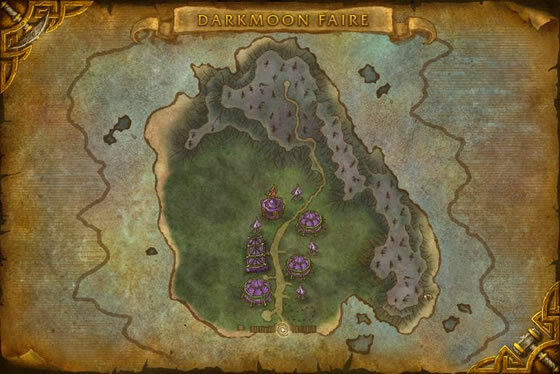 Fight all Darkmoon Glowfly that you can find on the island. When you kill them all, switch to your other char, parked on the island, repeat. They respawn pretty fast, and all crows are in the team with Darkmoon Glowfly. 10:00, 2/8/15, Opening day of the Faire. I just caught an Uncommon S/S breed, as a secondary to a Darkmoon Glowfly @ 70,78. How lucky was that? Just gto a common P/S. Pretty happy. First battle against a Darkmoon Glowfly (45.2, 50.3) tonight netted me a grey S/S. I think I'll just stone, and call it a day! For those asking about looking for pets on low-pop realms - yes that does work. Your battle pets are Account bound which means you can use on any toon on any realm, in any region, alliance and horde. As long as it's the same account you are good to go. My suggestion if you do this is to build a Death Knight. I built my DK on an Oceanic realm to get my minfernals, scorplings, wharf rat and snowy owl. Going to go do Darkmoone Faire now and get my Crow. What won't work is if you are collecting Darkmoon Faire tickets - they are toon based, so any tickets I earn on one realm I can't send to another. I keep seeing people suggesting taming pets using toons on different servers. How does this do your toons on your main server any good? Can you link battle pets across servers? I really want to get some rare pets that I haven't managed to capture so far, but I don't want them to be stranded on another server so they aren't in my main toons list. got a blue one today level 6, it was the 2nd pet. Got mine at 34.1, 74.8 spawn place. Was poor but meh I will stone it up to blue. I have seen at least two comments that they show up as level 6+ secondary battlers. I have just gotten one as a secondary battle pet, both level 5. Furthermore, I have picked up 3 total crows now, at various points around the island. Just battle all the pets, even the low level ones to get respawns. Also got the sea pony at the underwater cave (below the sunken ship, off the middle of the east coast at the edge of the fatigue zone) in about 20 casts. There seems to be a LOT of confusion with Call of Darkness and Nocturnal Strike, so I thought I would help clear it up. The Nocturnal Strike tool tip states "Base hit chance increased to 100% if the target is Blinded". Weather effects ALL front pets in battle. The tool tip (at top of screen once cast) for Weather Darkness states "Accuracy reduced by 10%"
This pet's Call of Darkness and Nocturnal Strike combination sounds deadly; however, like many others on here have said, it is broken. One person said it worked pve but not pvp for him or her. For me, it was broken in pve also. It seemed to switch the probabilities on me. I NEVER hit with Nocturnal Strike so far, and to make it worse, the enemies have yet to miss. I thought the Call of Darkness was suppose to work the other way, Blizz. WTH? Still glad I finally got my rare. Just wish that power combo worked the way it says it will. I tried serveral times over the past 3 days to get a rare one and my efforts were rewarded this morning with a rare S/S breed. I suggest trying characters from different servers to farm this little guy. Good luck & have fun! Is it just me or does "Nocturnal Strike" seem to have a very high miss rate after "Call of Darkness", when its supposed to be 100%. This is definitely a great alternative to the S/S Gilnean Raven. From my experience the Crow only comes up as a secondary pet. I've found that battling a level 6+ battle pet on Darkmoon Island yields a secondary pet in battle (sometimes a third pet as well), but anything with a lower level typically yields only itself in battle. You want to look for anything level 6+ to battle with, if you're looking for a Crow that is. I got mine as second to the glowfly. They were in the spawn points on that map roughly. My first was a lvl 7 green and second was a lvl 9 BLUE :D :D was crossing my fings at that point because I had scoured the most part of top forest and had just got to the tip/end with nothing but more grey one off glowflies (far right point was ma bluey). While smaller than the infamous ravens of Gilneas, crows are no less clever or cunning.